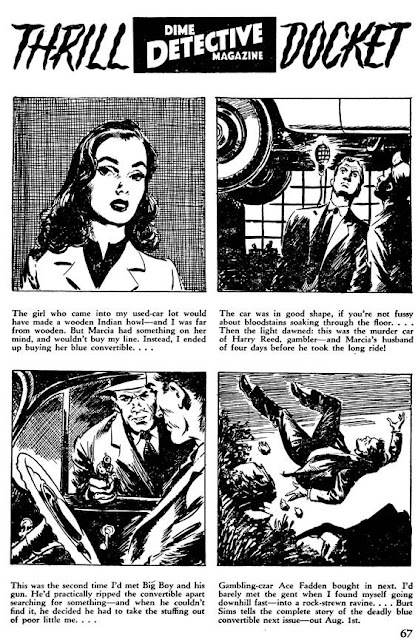 John D. MacDonald’s last story in Dime Detective contains all the elements of a Travis McGee story a dozen years before the first McGee book, The Deep Blue Good-by, was published. The Korean war veteran traumatized by battle, physically and mentally recovering; the siren with more curves than a mountain road, and a conscience to match; a sweet but tough damsel that is the object of the soldier’s love; and a buck-toothed hoodlum who doesn’t balk at leaving a trail of bodies behind him. In this story, the siren is the soldier’s ex-wife, portrayed as a hard-as-nails hussy` caught up in a drug smuggling ring. She drags him, unwillingly, into protecting her from the smugglers, who aren’t too happy about the situation. All this happens on a train to Chicago, where the ex-wife’s lawyer gets murdered. The main weakness of this story is the middle, when the ex-soldier goes into witness protection in a Chicago hotel room, but the buck-toothed hoodlum gets into the room. How he got past the guards, we don’t know. I opened my hand. The knife fell out. I looked stupidly at the blood on my hand. And then I looked at Marj. She was the color of a skid-row handkerchief. Her eyes were holes in the side of the world, leading nowhere. She wore a blue something-or-other hung over her shoulders. Underneath the blue was black. Black lace and shiny black satin. She had blood on her hand, too. She was breathing fast and hard, putting considerable strain on the black lace. Tod Horton is a recovering alcoholic who has pledged his fiancé that he will not have a single drink in eleven months. Yesterday, he broke his pledge, and comes to the office trying to hide it by dressing well and being well groomed. His fiancé remarks on it, and his partner notices it too. They talk about the business and Tod wonders why they aren’t making more profits even though the revenue has doubled. Kenny, his partner, says that costs and revenues have increased together. Remembering that their accountant, Gerald Katt, made a pass at Tod’s fiancé, they decide to replace him. After they talk, Gerald comes in and tries to blackmail Tod into retaining him by threatening to disclose Tod’s slip to his fiancé, Evelyn. Tod is infuriated and goes after Gerald, knocking him unconscious. Everyone in the office complex sees the fight. Tod comes back after lunch to find Gerald dead, having been shot by Tod’s revolver. Kenny takes Tod away from the office to his cabin in the woods, and leaves him with a drink. By now, you probably know who the real murderer is. And that’s why I felt disappointed, after reading four pages, to realize that the story played out in a very predictable manner over the next eleven pages. It’s one of the little pleasures of reading the pulps to come across a good story by an author you’ve never heard of earlier. This is one of those moments with a story that reminded me of Raymond Chandler. THE man sat there next to the elevator, perching his meager hundred and twenty pounds on a small wooden stool. He was a gaunt old fellow, with small bony hands and a thick puff of hair as white as absorbent cotton. Time had stretched his thin parchment skin too tightly over his rugged cheek bones, and his watery blue eyes gave the impression of being lost eons ago behind the wrinkles etched so deeply on his thin face. His head nodded forward on his chest and he moved woodenly to put it back. He caught himself dozing often these past few months. He was tired, very tired. Somewhere a door slammed and he stirred slowly, lethargically. It can be murderously hot in mid-July—particularly in the City Hospital, running the night elevator. The mechanical annunciator in the outmoded wire cage was strangely silent; everything was strangely silent. It was as if everyone living had surrendered to the heat, the hot, sticky waves of sultry heat that rose in ever-widening circles from the sunbaked pavements and spiralled up over the entire city like the undulating coils of a giant snake. HE TURNED, peering at the sound. He couldn’t see the face, but a huge, dark form was standing on the grass nearby. It was tall and broad, with the kind of proportions usually found only in the prize ring or the circus. He moved ominously toward him. Joe walked out of there into the black velvet night. Greta Schermerhorn was hanging onto his arm. He was too dazed to wonder about it, and they didn’t speak, walking down the dark cinder driveway in silence. She stopped finally and faced him, the small perfection of her face turned up toward his. I’ll be looking out for more stories by Albert Simmons, about whom not much is known. 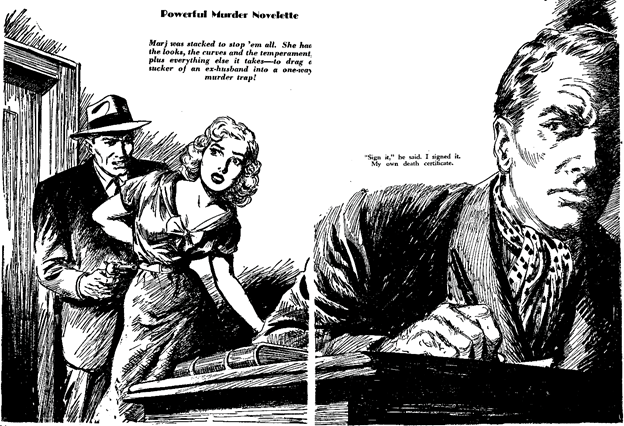 He had over a dozen stories published in the pulps and crime magazines between 1950 and 1959, 9 in the pulps. A reformed thief returns home to find his elder sister has acquired a boyfriend while he was in prison. The boyfriend is the cop that caught him. He wonders if the cop is capable of human feeling at all, and whether his sister will be happy with the cop. He goes back to the nightclub that he used to hang around in before his arrest, the nightclub whose owner asked him and a friend to commit a robbery, the nightclub for whose pianist singer he was carrying a torch before he went to prison. The nightclub owner tells him to stay away from the pianist, and then he falls, unconscious. When he wakes up he’s holding a knife, and near the body of his accomplice in crime, who had turned informer and whose evidence had put him in prison. In the doorway is the cop, who has been called by a neighbor. He fights with the cop, breaks out of the room and goes in search of the real murderer. 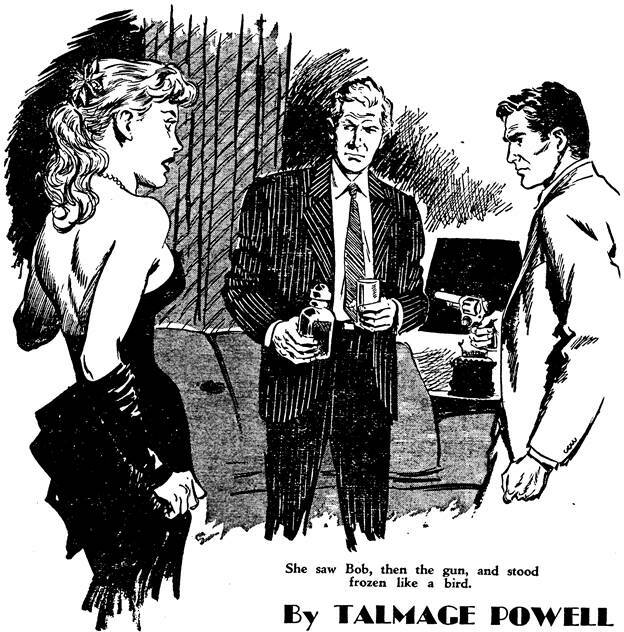 An average story from Talmage Powell, who had many stories in the pulps. Mary and Jim have been having a lot of arguments lately. 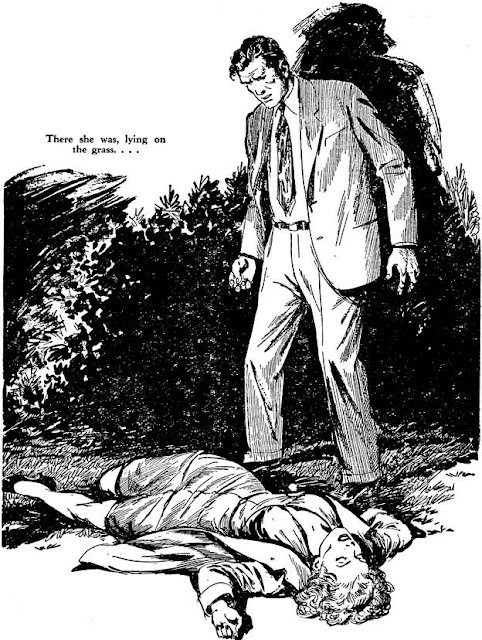 All the neighbors have got used to the daily fights, and tonight Mary heads out for a walk after her fight, and comes back home to find Jim’s body on the floor. She pulls out the knife that stabbed him, and gets her clothes wet with blood. She then decides to call the police but realizes that all the evidence is against her, so she cleans herself up, hides the bloody clothes and then calls the police. 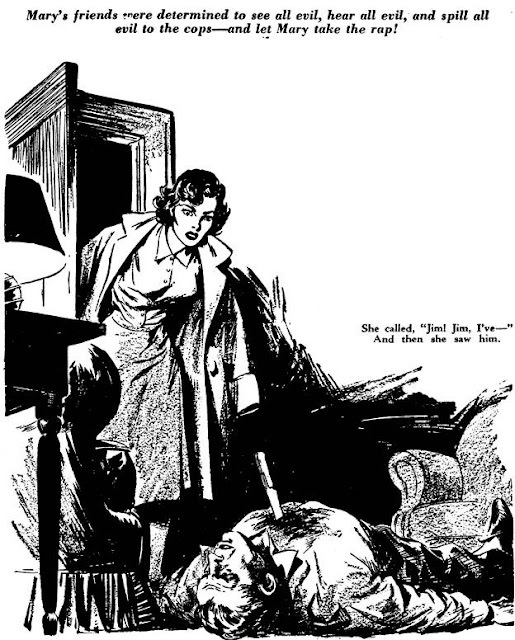 The cops find the clothes, and her fingerprints on the knife, and are ready to close the case when one of the police detectives gets a hunch that she is innocent. An average story, nothing stands out. Marty and Belle have come to Mexico to get evidence from the doctor of Erden, the criminal who Marty thinks killed his father. Erden’s alibi was provided by the doctor, who proved that Erden’s knee was so bruised that he couldn’t stand. Marty is consumed by the idea of revenge. They’re both strained and tense of waiting for the doctor to confess his part in the murder, and this has severely strained their relationship. Belle, who has been trying to get the doctor to brag about his part, cracks under the strain pushes the doctor off a boardwalk on to rocks nearby, and he sprains his ankle. They’re both unnerved by this and decide to call off the plan to get revenge, and decide to head back home the next day. The next day, though, Marty discovers Belle wounded, and confronts the doctor, who claims he couldn’t have done it because his ankle is badly sprained. What happens next is interesting, but not surprising to anyone who’s ever had a dental procedure. The first half of the story is well-written. Eunice Caron is visiting Harvey Bedford, the local lothario, for a quick afternoon tryst before heading off to the country club for a round of golf with her friends and their husbands. As she is going in, she sees a handsome stranger leaving the place. 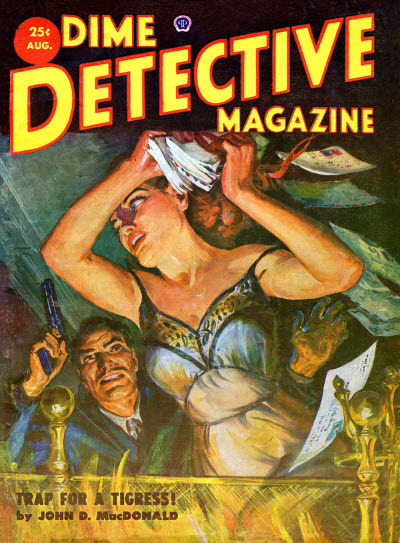 She is alarmed but goes in anyway, to discover Harvey is putting a pistol to his head. She tries to grab it from him, and in the ensuing struggle the gun goes off, burning her hand and ending Harvey’s life. 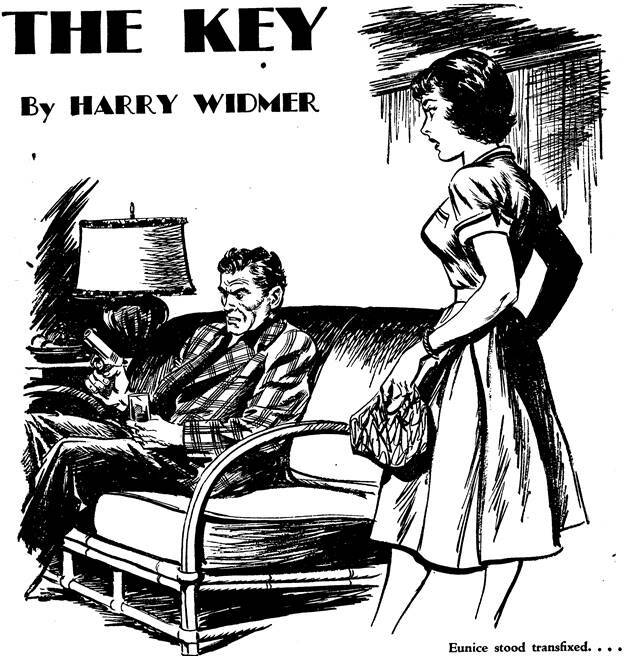 This is a cracker of a story by Harry Widmer, possibly the same Harry Widmer who was the chief editor of A.A. Wyn’s Magazine Publishers, and edited Ten Detective Aces. Short and with a wicked bite at the end, it’s the perfect antidote to the predictable stories I read earlier in this issue. Harrigan, a honest policeman, and his wife Laura are going through a tough period in their marriage. Laura feels that Harrigan’s humanity is being diminished by his job, and Harrigan feels that he’s losing her. Tonight Harrigan is going out to raid the Fallon mob, and he expects to find Laura’s brother, Lonnie, among them. Lonnie has managed to conceal his heroin addiction and the consequent degradation of his character from Laura, but Harrigan knows the truth. He writes a letter to her, explaining the situation, and asking her to choose between informing her brother of the raid and letting the raid go through, no matter what the consequences are. Then he leaves their house. Harrigan is waiting for the mob to break into a jeweller’s warehouse. But things go wrong, and the mob hits another location. 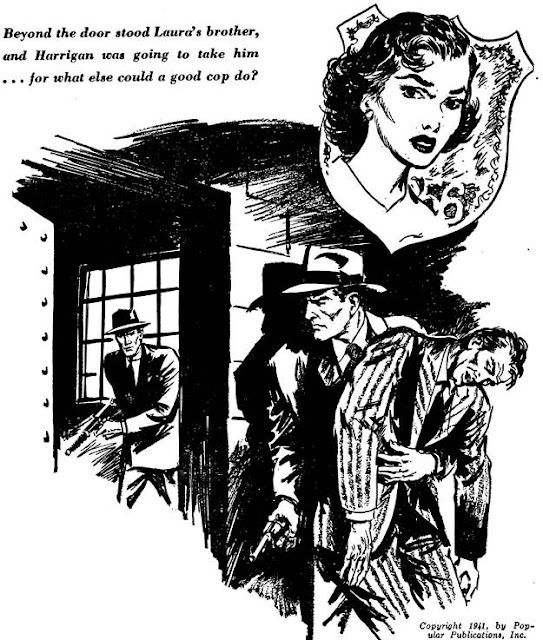 Harrigan believes that Laura has informed her brother of the raid, and knowing her choice, realizes that some other policemen are going to die because of his choice. He volunteers to go in alone after Lonnie, and the other policemen let him do it, realizing that it might be his only moral choice. Well written hardboiled story by Ormond Robbins, who specialized in weird menace and detective fiction. Waggener is likely Oren Waggener, with Jakobsson contributing the text and Waggener the illustrations. The Thrill Docket gives an peep into a story in the next issue (Beautiful, Blue and Deadly! 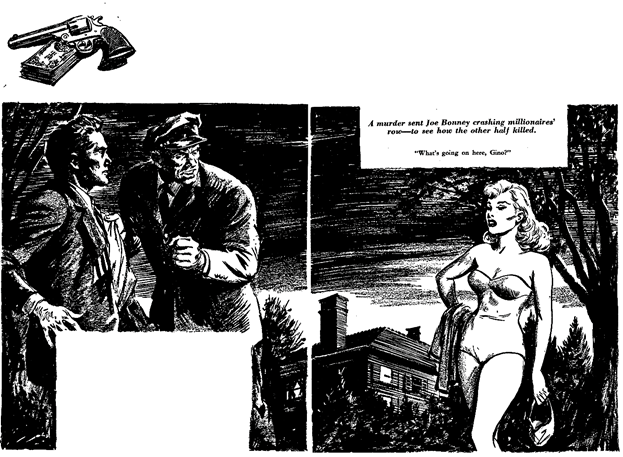 by Burt Sims in Dime Detective Magazine, October 1952). 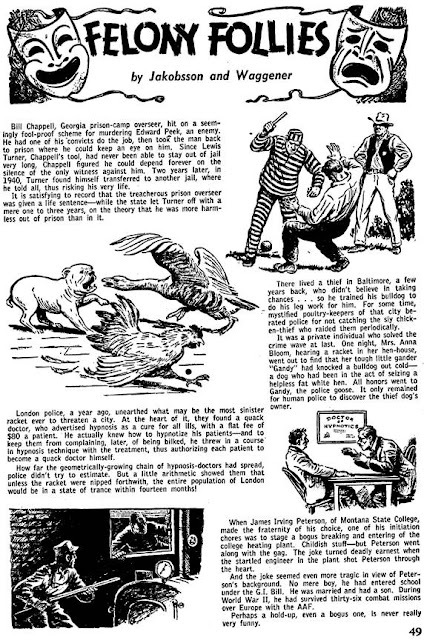 As you point out DIME DETECTIVE was starting to use reprints and declining in the 1950's. 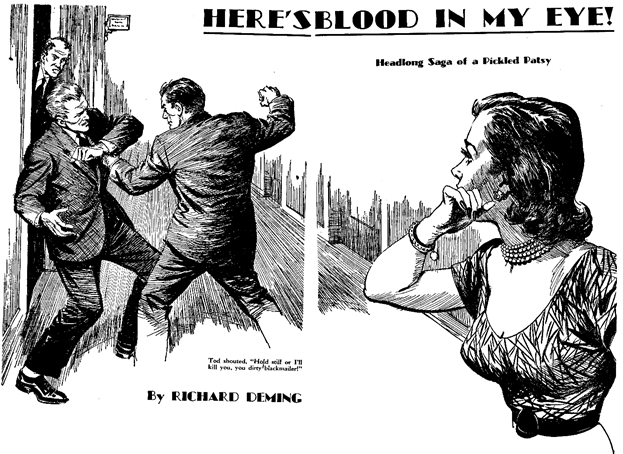 But it was still an interesting hard boiled magazine with some good fiction. I don't know who did the interior art but I sort of like his rough and hard style.